All UCLA Clinics are designed to prepare players for the next stage of their competitive play, whether it be at the high school or collegiate level. Players are grouped based on experience, age, and school. 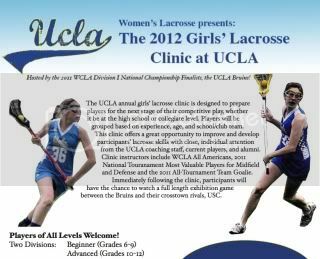 Bruin clinics offer a great opportunity to improve and develop participants' lacrosse skills with close, individual attention from the UCLA coaching staff, current players, and alumni. The 2012 clinic information is available for reference below. All 2013 information will be posted shortly. Registration includes UCLA Clinic, UCLA/USC Exhibition Game admission, t-shirt, and a chance to meet and greet many college level players and coaches! Please direct any questions to our clinic staff.